My current round of Story Cubes Challenge prompts comes in a weekly email, and I’ve chosen to use the prompts to draft a novel-in-stories to tell the story of an Exeter character who’s been on the fringes of the books to date: Joe O’Leary. While the eventual published novel-in-stories will be mostly chronological, the dice aren’t that cooperative. As a result, you’re getting the stories out of order. As a bonus for newsletter subscribers, the stories appear there first. 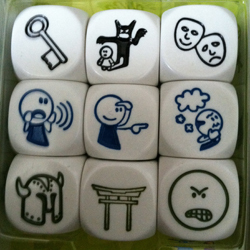 I’m migrating them over here with a delay, but arranging them on the Story Cubes Challenge page in chronological order. Mary O’Leary felt every one of her sixty-mumble years — she refused to count them anymore — as she watched her youngest grandson climb through the 3D maze that stretched between two floors of the Children’s Museum. A Boston trip was rare, but the discounted tickets were too good a deal to pass up. Timmy’s wide-eyed expression when they boarded the commuter rail train that morning reminded her of his father when Joe was not much older than five-year-old Timmy. Mary sat, since Annabelle was close to the space where Timmy climbed. He was so skinny, he slipped through the maze easily even though he had his father’s height. Not his temperament, though. A bigger boy pushed Timmy aside in his rush to get through the maze, but Timmy didn’t push back or shout at the boy. Joe would have wrestled the boy to the ground by now, and often had as a boy, his anger getting the best of him. Annabelle winced as the boy kicked Timmy in the shoulder, and Mary pursed her lips. She had always promised not to be that mother-in-law. She never wanted to meddle, never wanted her sons- and daughter-in-law to feel like they had to put on a mask when they came to visit to hide their real feelings. Timmy waved at her through the glass, his good mood unbroken by the encounter with the bigger boy, and Mary waved back. Annabelle did, too, but she swayed a bit as she did. Mary stood, aching feet forgotten. “Take my seat,” she said as she walked over to Annabelle. “You’ve been chasing him all day, crawling through the Japanese house and shopping with him in the market.” She steered Annabelle over to the bench, not liking the green tinge to her daughter-in-law’s face. There was a blankness in her expression, and Mary wanted to push. But the crowded museum wasn’t the place. Mary bided her time until they were on the train home, the afternoon still young enough that the car was almost empty. Timmy fell asleep before they even reached the Back Bay station, the Viking helmet Mary bought him at the gift shop for his Halloween costume tipped over his tired face. Annabelle ran a hand over Timmy’s shoulder. “No, this was a wonderful day for him.” Her other hand rested on her belly, and Mary smiled, her suspicion confirmed. When Annabelle saw it, she jerked her hand away, dropping in to her side so it rested on the bench seat. “Joe doesn’t know yet,” Annabelle said, her voice barely audible. “You’re probably right,” Annabelle said. But she didn’t meet Mary’s eyes, and for the first time, Mary wondered if she had missed something. She watched as Annabelle fell asleep, one hand curved over Timmy’s shoulders, and wondered at the lines carved deeply enough around her eyes and mouth that they didn’t vanish while Annabelle slept.